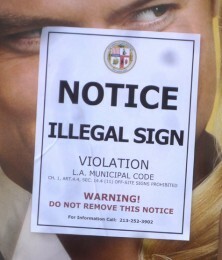 Numerous mini-billboards belonging to Fuel Outdoor were tagged with “Illegal Sign” notices overnight on major streets in West L.A., three days after they first appeared on signs in the Venice area. The persons responsible–called “renegade sign bandits” by a building department spokesperson–haven’t identified themselves or made any kind of public statement about their activities. The official-looking notices are apparently intended to call attention to the fact that the Fuel Outdoor signs were all erected without required city permits, but still remain on city streets despite the fact that the company has lost its legal challenges to the city’s sign ordinance.